Rwenzori Mountain region ecosystems and people are vulnerable to climate change impacts due to an increasing population growth in the area with over dependence on natural resources for their livelihoods. WWF in collaboration with Environment Management and Livelihood Improvement (EMLI), and the Climate Change Department of the Ministry of Water and Environment conducted a training for the Southern Albertine based CSOs and CBOs in climate change adaptation. The scope of the training included understanding legal and policy frameworks on climate change in Uganda, fundamentals of weather and climate, climate change impacts, risk management, climate change vulnerability and capacity assessment, adaptation planning and the principles of climate smart conservation. 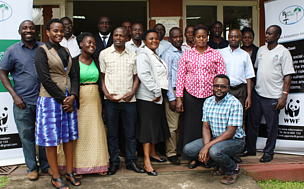 As unsustainable utilization of natural resources and poor land use management practices accelerate climate change impacts in the Rwenzori region, more collaborative efforts between Government, businesses and civil society are needed to address information and financing gaps on climate change adaptation. This will help reduce vulnerability and build resilience of both people and ecosystems to climate change impacts. The Rwenzori region is hit hard by the impacts of climate change. Glacial recession, increased average temperatures, increased occurrence of flash floods with increased intensity, prolonged dry spells leading to reduced crop yields, observed increase of invasive species in the protected areas and increased incidences of fire outbreaks are some of the challenges communities have to grapple with. In an effort to contribute to addressing the climate change impacts in the Albertine Graben, World Wide Fund for Nature, Uganda Country Office (WWF-UCO) with funding from Norad through WWF-Norway is implementing the Africa Adaptation Initiative (AAI). This programme is aimed at mainstreaming climate change adaptation into WWF Africa conservation activities, and thus minimize the impacts of climate related risks and disasters on vulnerable communities and ecosystems in targeted African countries where these are supported by WWF, and to enhance social and ecosystem climate resilience.